After generally scoffing at the notion of “varietally correct stemware” for most of my drinking life, I had the opportunity to try a Riedel wine tasting last year that absolutely stunned me. Wines both white and red that tasted, you know, fine in the so-called “joker glasses” revealed entire new layers of complexity and interest when sipped from the proper Riedel stemware. I was a convert. But would the same hold true for bourbon? Would a Riedel “bourbon glass” enhance the flavor of bourbon in a way that a regular rocks glass doesn’t? The short answer: Yes – although the difference was not as marked with bourbon as it was with wine. In a highly unofficial taste test this week, I sampled Four Roses Single Barrel and Maker’s Mark from a typical rocks glass and from a Riedel Bar bourbon glass. The bourbons tasted good in both glasses. Unlike my experience with wines – reds in particular – I didn’t notice a tremendous “blooming” on my palate when I sipped bourbon from the Riedel. The most notable difference was the amount of fire from the alcohol – much less from the Riedel glass. This did allow me to taste more of the bourbons’ flavor profiles. The Riedel glass is made of lead crystal, but I think what makes the difference in the tasting is its shape: curved and narrower at the top, much like a white wine glass. When you drink from a rocks glass, you can toss the bourbon back; all of the flavor notes (and the alcohol) are concentrated at the back of your throat. This effect is exaggerated even more when you drink a shot. The Riedel glass forces you to slow down – to sip and to savor. The bourbon has a chance to cover more of the tongue, so you appreciate more of its complexity. 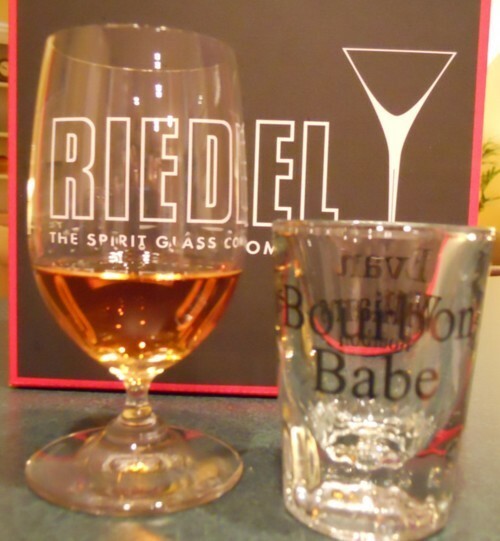 Bottom line: The Riedel glasses are nice, and sort of impressive, but I wouldn’t rush out to buy some for bourbon.